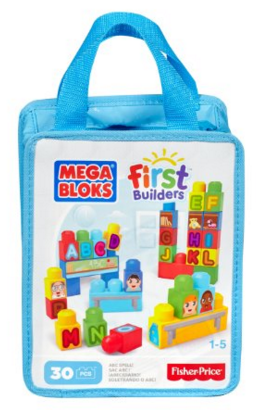 Mega Bloks First Builders ABC Spell, 30-Piece (Bag) Just $8.39 Down From $12! You are here: Home / Great Deals / Amazon Deals / Mega Bloks First Builders ABC Spell, 30-Piece (Bag) Just $8.39 Down From $12! Here’s a fun Christmas gift idea for your little builder! Mega Bloks First Builders ABC Spell, 30-Piece (Bag) is just $8.39 down from $12 on Amazon! Get yours now while it lasts!